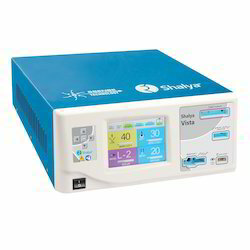 Providing you the best range of saline plasma bipolar resection electro-surgical unit, saline plasma bipolar resection device, shalya bipolar tur cautery, urology plasma kinetic bipolar resection electrosurgical generator, bipolar plasma resection electro-surgical unit and bipolar turp diathermy machine with effective & timely delivery. 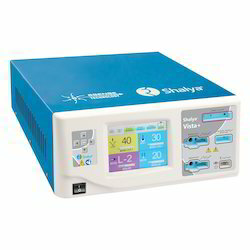 An 300W Electro-Surgical Unit with inbuilt Electrosurgical unit & Saline Resection (BITUR) mode for Various applications like TURP,TCRE, Hysteroscopy, Arthroscopic Surgery & Removal of fibroids ,polyps from the uterus. Accessories used: Saline cutting loop, vaporization loop, needle electrode, ball electrode to perform resection of the prostate gland as well as endometrial wall of uterus. 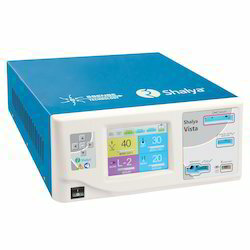 This device is also known as Saline Plasma Bipolar Resection Device, Saline Plasma Bipolar TURP , Plasma Bipolar Urology, Bipolar Plasma Resection, Bipolar TURP Diathermy, Saline Plasma BiTUR, Plasma Bipolar Resection, Plasma Bipolar Resection for TCRE, Saline Plasma Bipolar Hysteroscopy ,Plasma Bipolar Arthroscopy, Bipolar Arthroscopy Diathermy, Shalya Bipolar TUR Diathermy, Shalya Bipolar TUR Cautery. 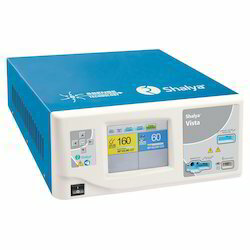 A touchscreen Electro-Cautery having electro-surgery mode, vessel sealing mode & Saline Plasma Resection mode. Saline Plasma TURP is process performed to resect the enlarged prostate gland using a high functioning microprocessor controlled cautery having Saline Plasma Cut & Saline Plasma Coag mode as well as electro surgical cut & coag modes. An Electrosurgical generator combined with high precision Saline Cut & Saline Coag Mode for Plasma Bipolar Resection. 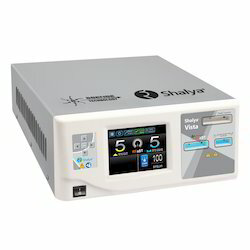 With touchscreen facility, this esu generator provides 4 Cut & 4 Coag mode in monopolar & 3 bipolar modes for esu. The Saline resection Mode has 2 modes at 200 W each. 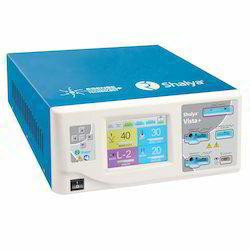 A 300W Electro-Surgical Unit with inbuilt Electrosurgical unit & Saline Resection (BITUR) mode for Various applications like TURP,TCRE, Hysteroscopy, Arthroscopic Surgery & Removal of fibroids ,polyps from the uterus. 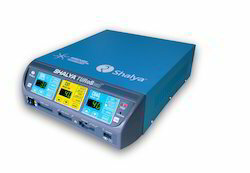 With storage capacity of 100 surgical programs, Shalya Vista is vividly used for TURP & TCRE applications. TCRE is a procedure used to ablate the endometrial lining of uterus using electrosurgical generator & associated accessory like Saline Resectoscope or Saline Hysteroscope. With varied application, like gynaecology, urology, ENT coblation, Saline Arthroscopy, Removal of polyps, endoseptal lining . 2 Si-Coag : Two Simultaneous coagulation output with independent control & independent power. System gives audio alarm after completion of coagulation to avoid sticking & charring. A touch screen electrocautery machine with specialized Saline plasma mode featuring 2 cut modes & 2 coag modes for saline resection. 100 surgical programs can be stored. TURP, TCRE, Hysteroscopy, arthroscopic surgery, ENT coblation, ablation of irregular tissue growth in uterus. 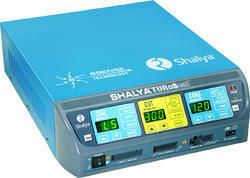 A specialized cautery machine to perform Saline arthroscopy having automatic accessory detection possible. Thus the power of connected resectopscope/hysteroscope is set accordingly.